Business in the Community Ireland’s (BITCI) Skills @ Work Programme gives secondary school students the unique opportunity to visit and experience the workplace. Carlow county Council opened its doors to secondary level students from Tyndall College Carlow as part of BITCI’s Schools’ Business Partnership (SBP)Skills @ Work Programme, an initiative that encourages school completion by partnering local businesses with schools to provide senior cycle students with the unique opportunity to visit and experience first-hand the workplace. 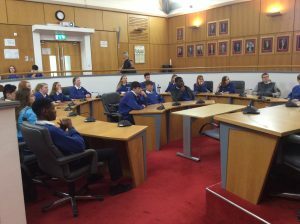 30 students were given a tour of the County Council by company employees and gained an insight into the many career opportunities that exist in the County Council. Representing County Council was Eamonn Brophy HRM, Jannette Kelly Environmental Awareness Officer and James Lakes Waste Control Officer who spoke about their roles in the County Council and also gave an insight into their route from secondary school to college to their current positions. Students were so interested in the talks and asked an array of questions about the county council and the work carried out in it. 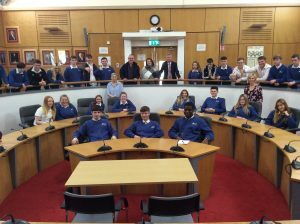 Carlow County were delighted to welcome students from Tyndall College to the County Council. They hoped that it provides the students with an insight into various careers and what work goes on in the County Council on a day to day basis. It is a great project that gives employees the opportunity to support a local school by providing this unique and practical insight into the world of work. Employees further have a great opportunity to showcase their skills and enthusiasm about where they work. Feedback from participants indicates that the workplace visit is one of the highlights for students involved in the Skills@Work programme. As well as giving the students a taste of the working world, they also experience important skills such as workplace etiquette and expected behaviour in a professional environment, one of the major adjustments needed in moving from school to the working environment. The site visit is one of a number of sessions in The Skills @ Work Programme. The programme also provides CV workshops, ‘A Day in the Life’ talks, mock interviews, company overviews, interview skill techniques as well as sessions on organisational skills and teamwork. Feedback from participant companies indicates that employees are gaining a huge amount from participating in the programme, including improving their own listening, communication and interpersonal skills. The programme is importantly helping the companies engage with their staff and local communities. Employees at the County Council are committed to assisting students at Tyndall College recognise the value of completing the Leaving Certificate and helping them explore possible career paths.